Lift Safe Direct have a range of mobile access platforms equipment which is available for contract hire and direct purchase for all your work at height requirements. Our range includes access platforms that can fit through a standard doorway and electric powered units which can be moved around by hand and use an electric lifter on them to assist the carrying of items down a mobile ladder. 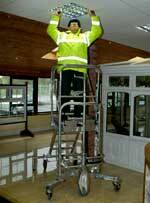 The Mini-Mobi incorporates the patented pedal drive system into a single piece folding work platform. With platform heights of 1200mm, 1050, 900, 750, 600 and 460 mm. The unit fits trough a standard door way and folds to fit into a small van or estate car for transport. Stockmaster is a very safe and easy to use stock picker. 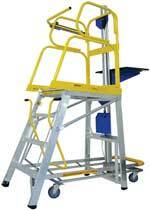 Items weighing up to 60 kg can be picked, lowered and transported in one action. The whole stock picking process can be safely handled by one person removing the need for a second person to pass items up or down.